With its high discovery potential and unprecedented performance, the LHC is a much-anticipated machine. Media and the public are eagerly following every development, and on 30 March, the communication teams provided wide coverage of the day’s historic events. The LHC is a machine of superlatives, and that includes its impact on science communication. 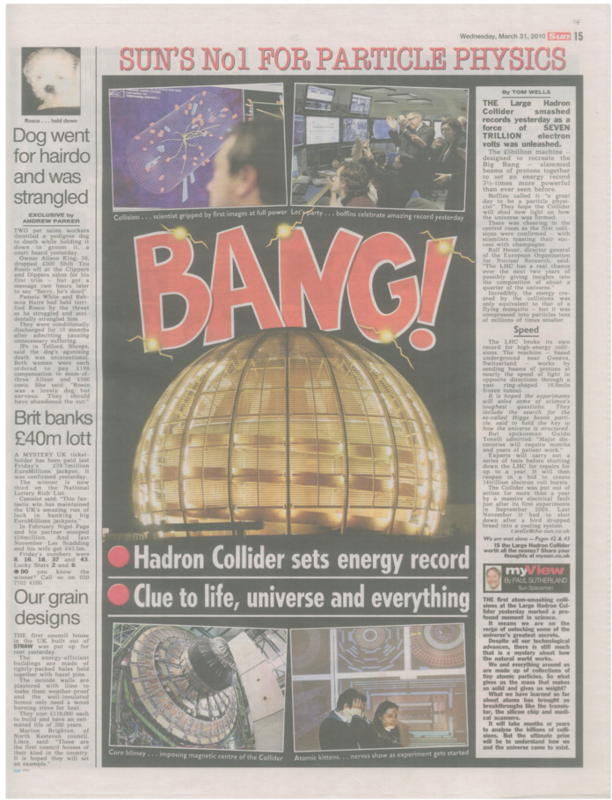 Never before has a particle accelerator been as well known as the LHC, or a fundamental science laboratory made such an impressive list of headlines in the world’s press. The news of the first 7 TeV collisions was covered by print, radio and television news around the world. At least 2,200 news articles were published in print and online on the same day (see graph). More than 100 journalists from 68 media outlets in 18 countries attended the event at CERN. CERN's public homepage recorded 205,000 visitors (unique IPs) from 185 countries, compared to a normal average of 10,000 visitors per day. The Press Office site (includes LHC First Physics site) recorded 154,000 visitors, up from a usual average of 2,000 per day. Live tweeting from the CERN Control Centre started in the very early morning. Very rapidly, the number of followers started to grow and went up to 120,000, an increase of 30,000 compared to the day before. The link to the press release announcing the first 7 TeV collisions was clicked on 58,000 times. The link to the webcast received 11,000 clicks, while that to the photos of the CCC received 16,000 clicks. The keywords "LHC", "CERN", "TeV" and "experiment" were all global trends on Twitter at some point during the day. In parallel, the LHC First Physics day-long webcast was visited by 700,000 unique computers (IP addresses), with an average of about 3 videos viewed by each. Together with other video material, it was rebroadcast by several TV channels. CERN’s LHC communication plan, drafted in 2006, began with the words “The aim of this plan is to gain maximum benefit in terms of public image for CERN and particle physics world-wide through the unique communications opportunity presented by the start-up of the LHC”. Its objective was to build a platform from which the particle physics community could engage with a wider audience than ever before. Mission accomplished.